These are the show notes to an audio episode. 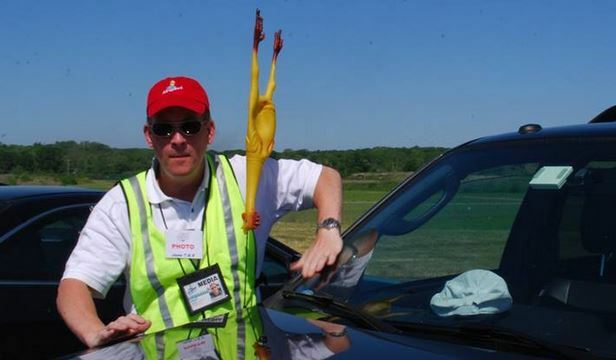 You can listen to the show audio by clicking here: http://traffic.libsyn.com/airspeed/AirspeedRoEWithPreRoll.mp3. Better yet, subscribe to Airspeed through iTunes or your other favorite podcatcher. It’s all free! We’re taking a break from the usual avgas and airshow smoke here on Airspeed to go a little meta. A few years ago, I wrote a FAQ section for the website. I called it the Airspeed Rules of Engagement. Mostly the backstory of the show and information about who I am, what I do, the philosophical bent of the show, and other information about why Airspeed exists and where it’s going. I turned it into an audio episode and, strangely enough, it has become one of the most popular episodes and resulted in a lot of feedback. So I thought I’d take an episode and update the Rules of Engagement here in Airspeed’s ninth year. Here we go. The Airspeed Rules of Engagement are available here. I’m very proud of what Airspeed has become. I was standing in a photo pit at an airshow a few weeks ago when a guy turned around upon hearing my voice and said, “Hey! You’re him!” It’s a great feeling when that happens and it happens more than I ever expected it to. And I get e-mails from some of you who tell me that you’ve started flight training. Or re-started flight training. Or re-re-started or as many “re’s” as life makes necessary. Some of you have undertaken other projects or begun or continued other journeys that are just as compelling. Some of you tell me that you’ve made astonishing, terrifying, and courageous decisions and that something I said had a part in getting you on that trajectory. Wow. Just wow. Brian Eno is reputed to have said that the Velvet Underground’s first album sold only 30,000 copies, but “everyone who bought one of those 30,000 copies started a band.” If you happen to be in search of a proper measure of real success and a life well-lived, may I tender Brian Eno’s words as an excellent candidate. And, though Airspeed is far from the “30,000” and “everyone” parts, some of you who have “started a band.” In fact, many of you have. You have flown, written, played, spoken, sung, counseled, taught, and – most of all – dared. I am proud of Airspeed for many reasons. But that’s the big one. If something I said was a part of you daring to do a worthy thing, I’m flattered beyond any real ability to describe it. Thanks for joining me on this journey. And for what you’re going to do next. And the thing after that. 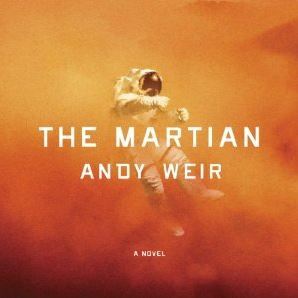 This episode’s Audible selection is The Martian by Andy Weir. Get is for free today when you sign up for a free trial at http://www.audibletrial.com/AIRSPEED. I’ve admired the TED Conference since I discovered videos of TED talks online five or six years ago. Each presenter gets 18 minutes to express his or her “ideas worth spreading” in the most engaging way possible. A genuine “stand up, make sense, and sit down” presentation format that does away with the stuff that doesn’t matter and puts the important stuff out front. I think that my favorites thus far have been Jill Tarter and Mike Rowe. I’ve become aware through TED of people who have since become heroes of sorts. And I’ve come across ideas that I’d like to think that I’ve internalized and used to fuel much of what I’ve done, whether professionally or avocationally. The TED approach has had a lot to do with the way in which I’ve approached Airspeed over the last six years. After all, what else could be to blame for a suburban schlub who’s talked his way into military aircraft, flown with some of the best airshow performers out there, and become a competitive aerobatic pilot himself? Download a free copy of the white paper by clicking HERE . In connection with my appearance on the new-media panel at the ICAS convention, I launched a white paper. As you know, I’m all about new-media types getting media ride seats at airshows and otherwise. If you’re an Airspeed listener/viewer, you know what new media and social media can do with audio, video, and other content generated from these rides. You know how this medium can go places and achieve depth of storytelling that traditional media hasn’t even heard of. For you and me, it’s a no-brainer to put a new-media rider up in the aircraft. But it doesn’t help to preach to the choir. 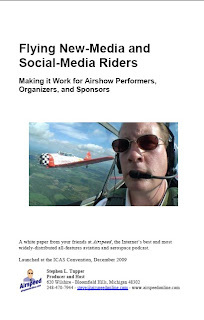 There are airshow performers, organizers, and sponsors who need good info about what new media and social media are in the first place. And then they need a concise statement of the benefit of flying new-media personalities. What it can and can’t do. And how to vet a potential new-media rider. So I wrote up this little white paper. I brought 35 copies of the white paper to the presentation (all I could put together in the time I had) and they went like hotcakes. I’m very pleased about that. For those who wanted a copy but didn’t get one, please click on the link above and download the document. And for those who find it helpful, stay subscribed. It’s probably going to go through several more iterations as I come up with new or better thoughts and revise it. And, if you have suggestions or want specific topics covered that aren’t in the document now, please leave comments on this post and I’ll take them into consideration as I update the document.